Neurotrophins (neurotrophic factors) are proteins which induce the survival of neurons and are found in the blood stream. Neurotrophins are capable of signaling particular cells to survive, differentiate, or grow. Neurotrophins are secreted by target tissues and prevent neurons from initiating programmed cell death – thus enabling the neurons to survive. Neurotrophins induce differentiation of progenitor cells to form neurons. The vast majority of neurons in the mammalian brain are formed prenatally; parts of the adult brain retain the ability to grow new neurons from neural stem cells, a process known as neurogenesis. Neurotrophins are chemicals that help to stimulate and control neurogenesis. During nerve development, neurotrophins help nerve cells decide if they are going to live or die. Neurotrophins are small proteins secreted in the nervous system at extremely low concentrations. 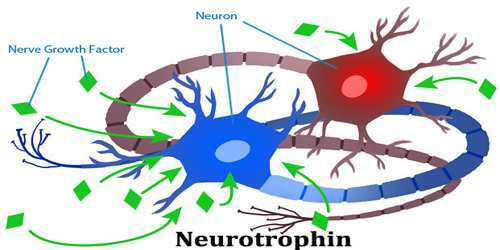 Low levels of a neurotrophin are needed to keep nerve cells alive. However, in some cases, presence of a neurotrophin can have the opposite effect, initiating cell-death. During development of the nervous system, levels of neurotrophins control unwanted nerve cells. Later, neurotrophins stimulate the growth of new dendrites and to cause unwanted dendrites to die back from crowded areas. There are two distinct classes of glycosylated receptors that can bind to neurotrophins. These two proteins are p75 (NTR), which binds to all neurotrophins, and subtypes of Trk, which are only specific for each different neurotrophins. 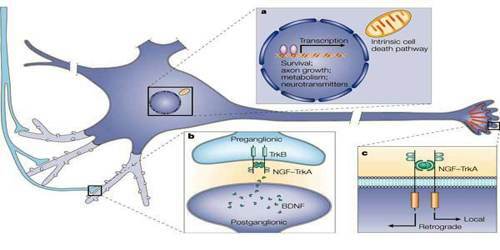 The signaling pathways activated by neurotrophins through Trk receptors result in many neuronal functions, such as cell survival, differentiation, dendritic arborization, synapse formation, plasticity, axonal growth, and axonal guidance. Functions ascribed to the p75NTR receptor are diverse, complex, and sometimes contradictory. p75NTR has been implicated in both promoting survival and inducing apoptosis, enhancing neurite outgrowth and facilitating growth-cone collapse, and mediating differentiation and enhancing proliferation. Moreover, p75NTR may also play a role in myelination. Neurotrophins are proteins with closely related structures that are known to support the survival of different classes of embryonic neurons. Neurotrophins is a generic term that describes a number of neurotrophic factors enhancing neuronal differentiation, inducing proliferation, influencing synaptic functions, and promoting the survival of neurons that are normally destined to die during different phases of the development of the central and peripheral nervous system. In the peripheral and central neurons, neurotrophins are important regulators for survival, differentiation, and maintenance of nerve cells. They are small proteins that secrete into the nervous system to help keep nerve cells alive. There are two distinct classes of glycosylated receptors that can bind to neurotrophins. These two proteins are p75 (NTR), which binds to all neurotrophins, and subtypes of Trk, which are each specific for different neurotrophins. Neurotrophins are of potential clinical interest since they influence the functional activities and survival of distinct neuronal populations within the peripheral and central nervous system. Neurotrophins are currently under investigation as therapeutic agents for the treatment of neurodegenerative disorders and nerve injury either individually or in combination with other trophic factors. 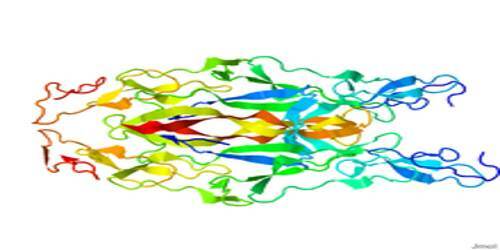 A number of diseases, such as Alzheimer’s disease, stroke, and cancer, may cause neural damage in part through the misfunction of neurotrophins. Current therapeutic strategies are to fight these diseases using neurotrophic factors to help and control any loss of nerve function. Unfortunately, neurotrophins do not last very long in the body when injected to the body and show significant side effects. How to write an Announcement of Play Letter?